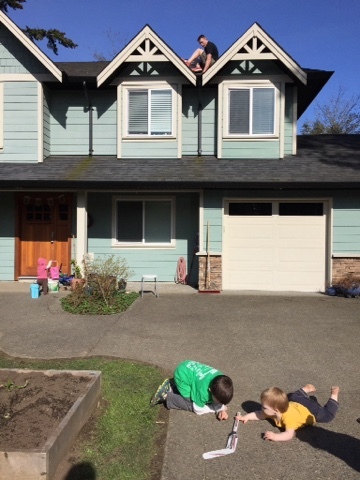 The gorgeous trees around our new house drop quite a bit of junk into the gutters so we all headed outside to clean up the mess on the first day that was 15degrees. The matching sweaters from Grandma! So cute and they wash up nicely after a lovely romp in the garden boxes. I started some lettuce and spinach before the small ones broke the glass...twice. The siege was tamed by hubby's lunch preparation. 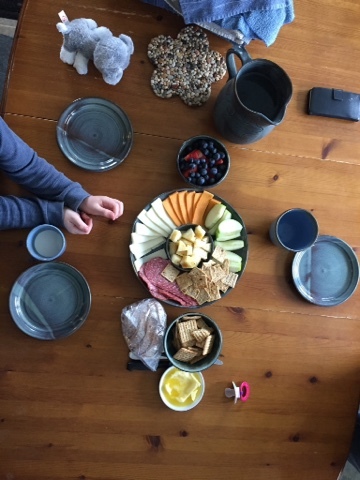 I walked in from the studio to find lunch ready and a quiet gang of kids! It is a daily treat to use my own handmade pots. 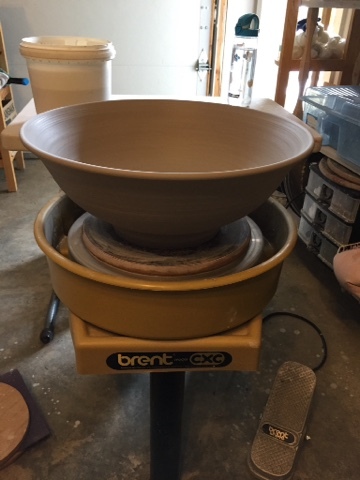 I was asked to make a cutlery drainer for Jenny (the face book friend who guessed correctly that my pots will be at The NEST:) so I made about a dozen or so and then had some fun with the slip trailer! 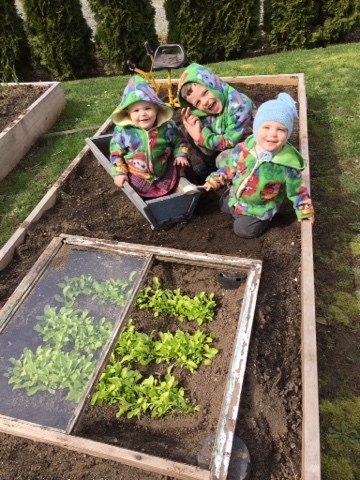 I was setting up a system to allow my gallery in Tofino to choose the pots they wanted without having to drive all the way here. This was the overall photo I sent. 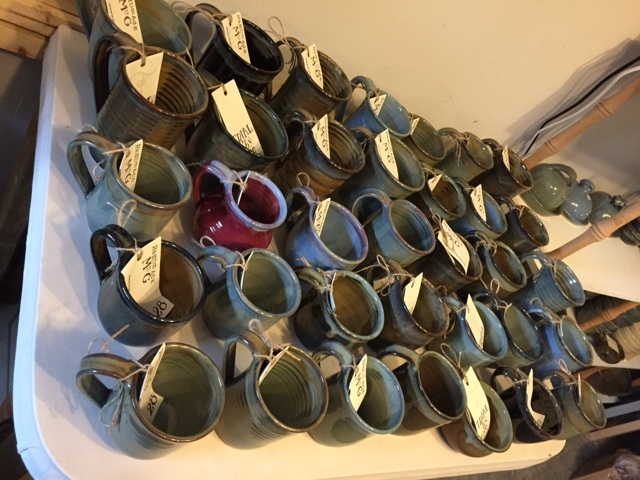 This was the plan: I would sort out 10 mugs, stack them in 2's then take a photo. 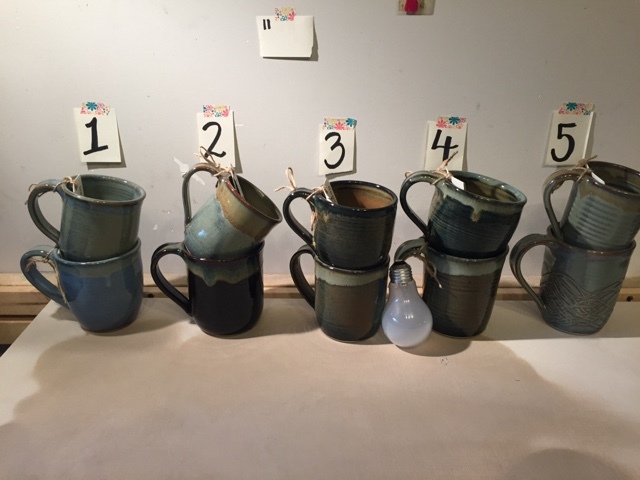 I sent a photo with a number on the email then the gallery owner would call me and I would take the mugs out of the lineup and put a little tape mark on the ones she liked. Then move them onto the 'done' table and repeat. The light bulb was for size reference:) We worked through 6 emails this way and it went very smoothly. In the end, I packed and boxed up about a dozen and paid the postage to get them to the far side of the island. We both felt that the other person should pay for the $18 shipping (she suggested I 'give' her a free pot to sell to cover the postage) The final result is that she decided to no longer carry my pottery....not a problem as long as she pays me for all the pots that are already there.....All the risk is on the artist with consignment as the postal system will not insure my work and it can sit without selling forever and sometimes getting it back can be a hassle. I am in the market for a new gallery in Tofino 60/40. So....I wedged and threw this monster to focus my energy toward something useful. 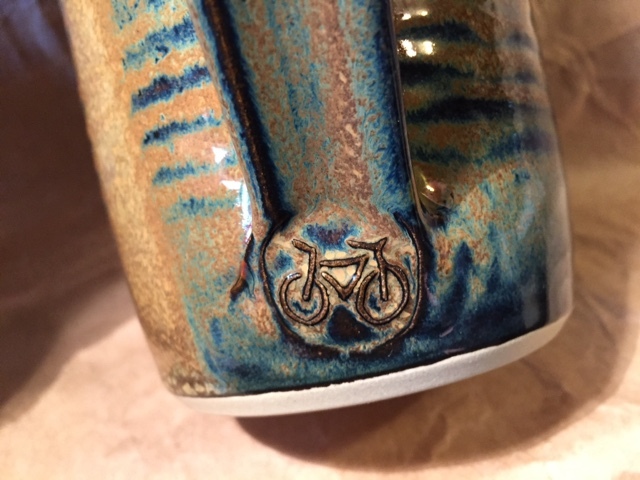 I just love this close up of my glaze and handmade bicycle stamp. 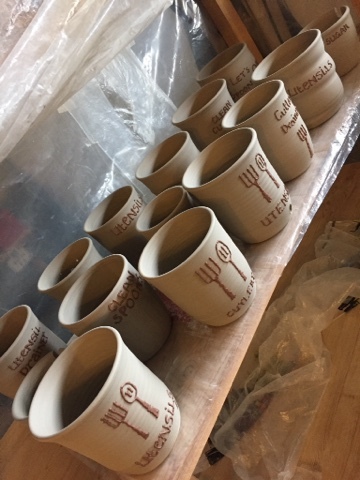 I love mugs, making them, using them and mostly seeing folks find the perfect one for their loved one to use everyday. Quite a few people have bought a 'move out' mug for their college bound kids and it actually brings a tear to my eye.